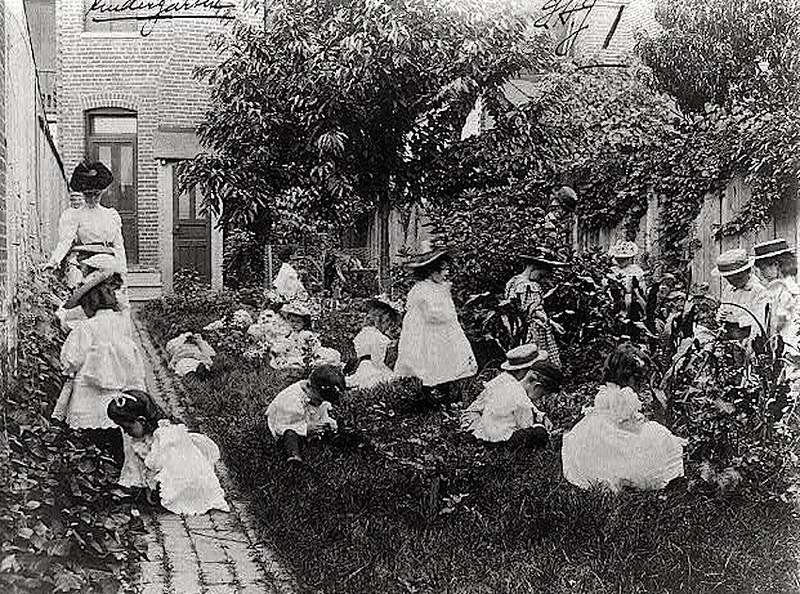 Life in gardens: Washington, D.C.
“Kindergarten in a vegetable garden,” Washington, D.C., ca. 1899, by Frances Benjamin Johnston, via Library of Congress Prints and Photographs Division. Before she became immersed in the work of photographing old houses and gardens, Johnston was a photojournalist and a portraitist. In 1899, she became interested in progressive education and made a photo survey of students at public schools in Washington, D.C. It is, although I’m not sure how many baby vegetables were left after the class departed. Maybe the teacher had them picking up snails and slugs. I love the couple of little guys in the back sacked out in the grass. A precursor of today’s school garden programs?